Explore the coastal city of Peniche and Berlengas Island on this full-day small-group tour from Lisbon. Drive along the Portuguese coast from Lisbon and reach one of the country’s best surf spots in Peniche to take the ferry to Berlengas Island. 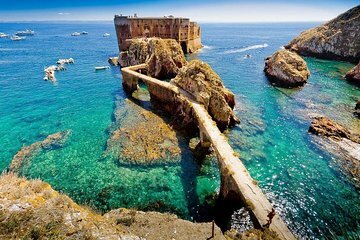 Explore the beautiful blue waters and small beaches of the island, the military fortress built in 1502, and the observe the local wildlife at the Berlengas Nature Reserve. Not recommended for pregnant women, infant and toddler. The island of Berlengas itself is beautiful, photos do not do it justice! I definitely recommend going to the island, however did not feel as though the tour was explained properly in the outline. I, along with the other members of the tour, felt as though we were ripped off. The cost of the tour only included the return trip in a 4WD to the port where we would leave for the island. We got to the port to leave and were told that the tour hadnt been booked and that we had to wait for them to find us a time slot. We were then told that we had to pay for the boat to take us to the island as well as the optional trip to the grottos. One couple on the trip had a baby and were told that they could easily take a pram up to the island, we were not informed that the tour of the island was more of a hike, and that there was absolutely no way that a pram would fit on the path. This couple ended up forgoing their tour. It would have been just as easy, and definitely cheaper, to simply get a bus to the port and organise our own tour with one of the companies there. Didn't even get a water!